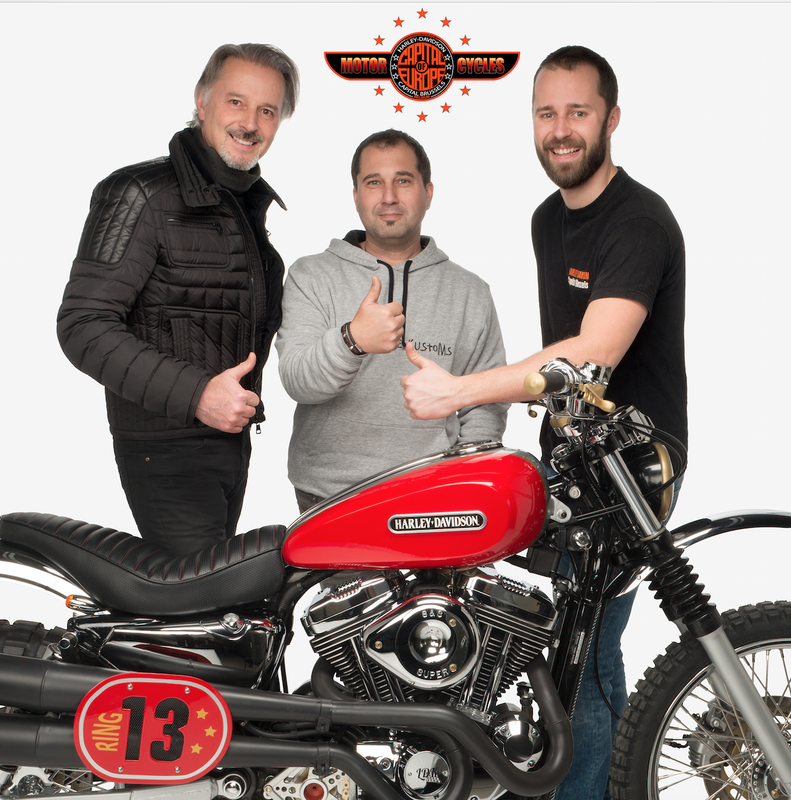 Mario Van den Broeck, owner principal of Capital of Europe bvba, presents with his son Kim Van den Broeck, manager of H-D Capital Brussels, the first Ring13 (Harley-Davidson Capital Brussels is located right at the EXIT nr 13 of the Brussels Ring ) Custom sportster Scrambler Bultracker. Mario began to ride enduro bikes at age of 10 and always liked very much the scrambler style of bikes like the forgotten make Bultaco. So recently he asked his good friend Francisco Ali Manen, famous custom builder from Spain, to help him creating a Scrambler with the looks of a Bultaco and the result is absolutely stunishing! From left to right: Mario Van den Broeck – Franciso Ali Manen – Kim Van den Broeck. The bike can be customized from an existing bike or offered as a new bike based on the sportster iron. Prices starting from 20.000 Euro. Mario’s “Bultracker" is a one–off with diverse upgrades like the chrome/gold upgrades, inner fairing painting, 80-spokes wheels, etc….